EDT are now registered as an NUS Extra card provider – and all EDT students are eligible to purchase an NUS Extra student discount card. What are the benefits of an NUS Extra card? An NUS Extra card entitles you to discounts from hundreds of high street shops, restaurants, travel providers and many more. Below are just a few examples of where you could use your NUS card. 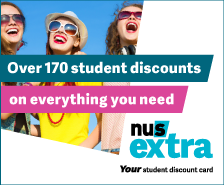 An NUS Extra card costs you £12 and is valid for one year, giving you plenty of time to grab loads of discounts.